Backless bar stools like the Amish Oakley Backless Stool add to the decor of the room while they save you space. No chair back means you can tuck them right under the counter or bar when they're not in use, keeping your kitchen in order at all times. The Oakley will blend well with any decor as it offers a transitional style that always adapts to change. 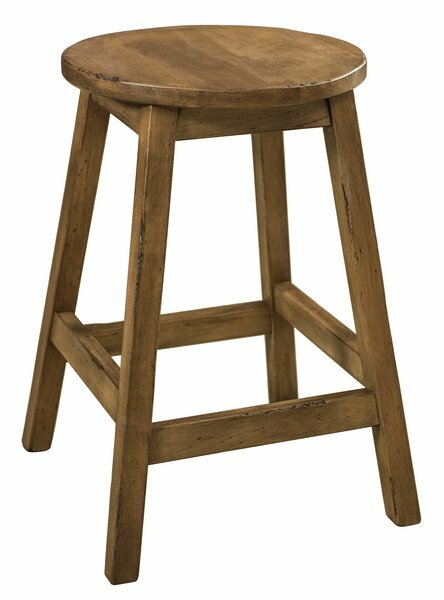 This simple solid wood bar stool features a round stool seat and modest thickness for the legs and stretchers. Attention is given to every detail of this Amish made furniture to make sure is is built to be strong, durable and beautiful. Let the Oakley be your choice at your kitchen island. Enjoy casual meals and a comfy place to sit and snack. Don't forget bar stool seating makes a great choice for your game room or crafting room. Move with ease at your sewing machine or crafting table in a backless bar stool. The Oakley is shown here in oak wood with medium stain. Oak furniture looks natural and warm with its defined wood grain that speaks to the beauty of the tree it came from. Shown in Brown Maple with Distressed Weathered Log stain.